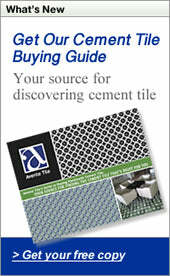 This blog is dedicated to the use, design and understanding of hand painted ceramic tile and cement tile. We encourage your comments. Your questions and comments are important and help ensure that a broad range of ideas is expressed and exchanged about this topic so that we all gain a deeper understanding. The sharing of ideas about these tiles will result in more informed consumers, smarter buying decisions, and satisfied customers. All comments posted to this blog are reviewed. We expect that participants will treat each other with respect where differences of opinion occur. To this end, comments are reviewed after they are posted. However, we will remove comments that contain vulgar language, represent personal attacks of any kind, or contain offensive terms that target specific businesses, organizations or groups. We will promptly remove comments that are spam, off-topic or promote services or products. Comments that make unsupported accusations will also be removed. Your comments are welcome at any time and we make every effort to respond to comments in a timely fashion. However, given the need to manage resources, comments are reviewed during regular business hours, Monday through Friday. Comments submitted after hours or on weekends will be reviewed as early as possible the next business day. For the benefit of robust discussion, we ask that your comments remain on-topic. We welcome suggestions for other topics you'd like us to publish and discuss, please send requests to info@aventellc.com with your contact information. Thank you reading our comment policy. We encourage and look forward to your participation in our discussion about hand crafted tiles.